The increase in daily rush hour traffic for Nashville, TN motorists has become an indication that the city is growing. The Greater Metro Nashville area has grown over the past decade to a point where city officials must seriously consider a plan for the future to accommodate the growing population, the growing number of cars on the road and the need for housing. In many areas around the city, residents are welcoming new restaurants and businesses in the area, but with the continued growth and change, Nashville, TN residents should also expect an increase in crime. Forbes’ annual The 10 Most Dangerous U.S. Cities list reflected that both Memphis, TN and Birmingham, AL – two major cities surrounding Nashville, TN – were in the 2nd and 5th places on the list. Although Nashville hasn’t made the infamous list, crime reports and statistics released from 2015 reflected that homicide rates had nearly doubled since 2014. The reports released by the FBI from their Crime Statistics database reflected that the homicide rate went from 41 to 75 homicides in Davidson County. After hitting a historic 50-year low with only 41 homicides in 2014, Nashville, TN saw the highest homicide rate in six years in 2015. 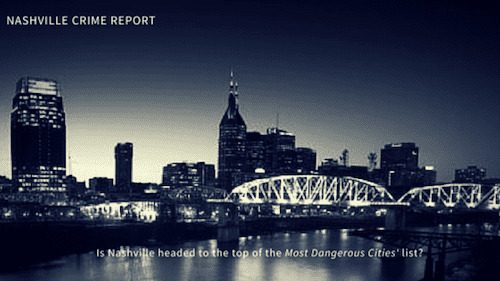 Although it takes a lot for a city to find its way onto the Most Dangerous Cities list, Nashville, Tennessee has been mentioned in numerous crime reports and news stories as one of the top cities seeing an increase in crime over the past few months. There’s no clear way to know if Music City will find itself as one of America’s most dangerous cities until the final numbers are in for the year, and of course once Forbes releases its list. If you want to see if there’s an increase in crime in your neighborhood, the best way to keep up with crime alerts is to check the crime statistics released each year by the Metro Nashville government. There are also websites like spotcrime.com that allow you to look up crime in your specific neighborhood. The Metro Nashville Police Department also offers crime statistics, crime reports and local crime maps. If you have been charged with a crime in Nashville, TN, contact criminal defense attorney Bernie McEvoy for representation (615) 255-9595.